Case was dead on arrival but panelist didn’t consider reverse domain name hijacking. Head Kandy, LLC filed a cybersquatting complaint against HeadKandy.com. National Arbitration Forum UDRP panelist Eugene I. Low has correctly decided in favor of the owner of HeadKandy.com in a cybersquatting complaint, but I’m perplexed why he didn’t consider reverse domain name hijacking. Head Kandy, LLC filed the complaint. The company started using the Head Kandy mark in 2015 and uses the domain HeadKandyPro.com. The owner of HeadKandy.com registered the domain in 2006. According to Low’s decision, the Complainant knew that the domain owner formerly used the disputed domain name to sell its own “Head Kandy” hair extensions, but such use ceased in 2013. In other words, the Complainant admitted that a) the domain owner had rights or legitimate interests in the domain and b) it wasn’t registered in bad faith. Nevertheless, Low did not consider if it was a case of reverse domain name hijacking. The domain owner hired counsel to defend the domain name. At a minimum, it would have been nice for the panelist to admonish the Complainant for filing a complaint that was dead on arrival. This morning I began writing an article about a UDRP for CloudInsure.com. My general thesis was that this should have been a case of reverse domain name hijacking. Once I started investigating, I had more questions than I had answers. According to the National Arbitration Forum decision, CyberRiskPartners, LLC filed the case against Drew Bartkiewicz. I should note that the 2012 trademark filing was on an intent-to-use basis. Also, note that the registration is on the supplemental registrar. I checked historical Whois records and verified that the current owner was the 2010 registrant. Given these facts, this UDRP was dead on arrival; the domain owner registered the domain prior to the Complainant even existing. But things got confusing when I went to view CyberRiskPartners’ website. 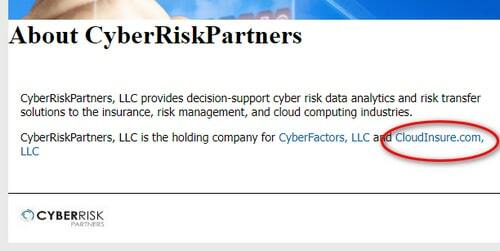 CyberRiskPartner’s website says the company is the holding company of CloudInsure.com, LLC. If you click on CloudInsure.com it forwards to CloudEnsure.org, a name that was just registered on January 8. Additionally, the Complainant submitted marketing materials and a business card to the USPTO in 2014 that included the CloudInsure.com domain name. 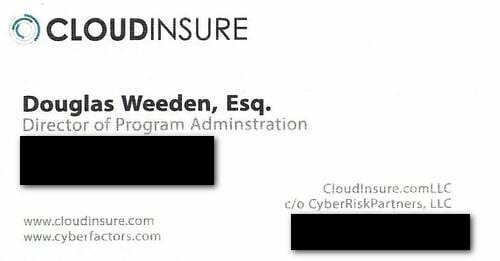 And if you go back to archives of CloudInsure.com, it says it’s a subsidiary of CyberRiskPartners, LLC. All of this would lead you to believe that the Complainant had control of the domain name at some point. But nothing in the decision alludes to this. I reached out to both the Complainant and Respondent this morning and did not immediately hear back. Some of the Complainant’s claims are easily disproven. I’m often amazed by cybersquatting claims under UDRP. This weekend I read a case that was extremely disturbing. Grimco, Inc., a distributor of products to the sign industry, filed a UDRP against the domain name Briteline.com. Briteline.com is owned by Mike Forde of Florida and has a registrant name of Briteline Consulting. Forde was unable to respond to the UDRP. According to a note the National Arbitration Forum (NAF) received from a person identifying herself as Forde’s sister, he sustained a serious head injury this summer. What bothers me about this filing is that I can easily show that this is not a case of cybersquatting under UDRP with about five minutes of research. Respondent undoubtedly was aware of Complainant and its BRITELINE mark as the Domain Name prominently features the BRITELINE mark and Complainant’s rights in the BRITELINE mark predate Respondent’s registration of the domain name. Again, this is easily disproven. The Whois record shows a registrant organization of Briteline Consulting. The name of the registrant organization contains the name “Briteline” but there is no evidence as to whether or the manner in which Respondent may have used this name in connection with a business, when any such use began, or the extent to which Respondent may actually have become known by that name. Fair enough. Given that Forde did not respond to the case, the panelist had no proof of a connection. But with a simple Google search for Mike Forde briteline consulting I discovered this business filing. It shows that a man named Michael Forde living at the same address listed in Whois started a business called Briteline Consulting in 1996, the same year the domain was registered. I understand that the panelist doesn’t need to do this search (and given the outcome of the case it doesn’t really matter) but the Complainant could have easily discovered this. Kuechenmeister denied Grimco’s case because the 1996 registration could not have been made in bad faith given the Complainant’s claimed trademark date. He should have gone further and considered a filing in abuse of the policy.